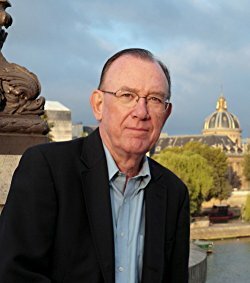 I’M THE AUTHOR OF TREASURE OF SAINT-LAZARE and its sequel, LAST STOP: PARIS, a pair of thrillers that started with this question: What would happen if some really bad guys thought — indeed were certain — they knew where to find a famous and priceless painting the Nazis stole in World War II? Now there’s FINDING PEGASUS, the third book in the Eddie Grant series. It’s a contemporary thriller set in Miami, Paris, and Hungary and dealing with the chaotic state of Eastern European politics, where long-term democracies now live in fear of Russia and of their own leaders. Eddie and Aurélie are back, as are Jeremy, Philippe, Paul and the others, and it has two appealing new protagonists — Kate Hall, a vivacious and brilliant former Navy engineering officer, and Mark McGinley, also ex-Navy. Together, the two make up more than one engineering genius. They have a high-tech submarine/helicopter drone duo (Pegasus and Icarus) that they plan to sell to the CIA, but when they finally decide to switch their traditional day sails to an overnighter, somebody bombs the sailboat and they barely escape with their lives. Off they go to Paris and then to the caves of Hungary, in search of their own treasures. THE RESEARCH I DID FOR TREASURE OF SAINT-LAZARE led to Poland and the Czartoryski Museum of Krakow, where a blank frame still hangs on the wall in place of Portrait of a Young Man, a painting the Italian Old Master Raphael made in 1514. It was looted shortly after the blitzkrieg and spent most of the war hanging in the home of Hans Frank, governor-general of occupied Poland. As the Russians were knocking at the door of Eastern Poland in early 1945, he sent it (with many other stolen treasures) to his home near Munich. He narrowly escaped from the Russian Army only to be hanged by the Nuremberg tribunal. THE OTHER TREASURES ARRIVED, but not the Raphael, and it hasn’t been seen in public since. The Polish foreign ministry has indicated it may be in a bank vault somewhere. Treasure of Saint-Lazare is set in Paris and Sarasota, Florida. Click on the cover picture for more details on the book’s Amazon site. It’s available there in Kindle, paperback and audiobook editions. Last Stop: Paris is set in Paris, Miami, Munich, and several parts of Eastern Europe. In it, Eddie Grant finally gets his hands on his evil antagonist. It’s been well reviewed, especially by Kirkus Reviews (see my blog post about that). Finding Pegasus (2018), the third in the Eddie Grant series, opens in Miami and rapidly moves to Paris, then to Budapest. I’ve been a serious fan of WWII history for thirty or forty years, since I lived in Frankfurt, where I edited a business magazine and reported for the International Herald Tribune on banking and finance in the German-speaking countries. After a couple of other careers, I live with my wife Jan (also a former journalist, she for The Washington Post) in Sarasota for most of the year, but we reserve a few months each year for Paris, where we especially like the 14th arrondissement around métro stations Denfert-Rochereau and Alésia. I invite you to join my mailing list, which I’ve dubbed the Eddie Grant Readers Group after my main protagonist, the Franco-American businessman and former U.S. Special Forces officer. He’s now married to the beautiful Sorbonne professor Aurélie Cabillaud, who also works as a visiting professor at American Universities, most recently Columbia. You can sign up on the form below. You’ll receive a message asking you to confirm your subscription. You’ll receive an email whenever I post a new story to my blog, Part-Time Parisian, or something interesting happens in the world of books and I add something to this site, John Pearce Books.